Join the Magician as his apprentice while he tours the world dazzling crowds with his cheap tricks. Click here to play! Learn all that he has to teach you and you could see yourself pulling a fortune out of a silken hat! As you are the apprentice, you'll want to stick close to the Magician. This magic man acts as a substitute symbol and will replace most other symbols to help you spin in more wins. He'll also bring in the biggest win. Spin one to five of this guy and you'll get up to 12500 times your line bet. He has a few tools to help him put on his show that you'll want to collect across the reels. The Magician's lovely stage assistant will bring in up to 2500 times your line bet if you can spin two to five of her across an active pay line. Bring in up to 1000 times your line bet if you spin two to five black top hats. There are also wands and tomatoes to help you spin in cash prizes. As any good apprentice knows, the ultimate trick is to pull the bunny out of the hat, so you'll want to spin as many bunnies as you can. This little white rabbit acts as a scatter. It will bring in up to 200 times your total bet and will trigger a bonus feature that will see you conjuring up even more prizes! 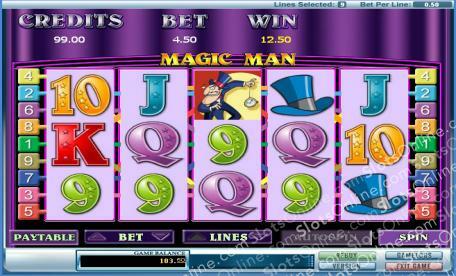 Learn all of the Magician's secrets and cast a spell to help you spin in plenty of big wins in Magic Men. The white rabbit acts as a scatter. If you spin two to five of these anywere on the board, you will get 1, 5, 25 or 200 times your total bet respectively. Three or more will trigger a bonus feature. The tricky Magician acts as a substitute. He will replace all other symbols, excluding scatters, to help you bring in more wins. If you can spin one to five of him across a pay line, you could get 2, 10, 250, 2500 or 12500 times your line bet. Spin three or more scattered white rabbits anywhere on the board and you will trigger a bonus feature. During this feature you will get to choose from a selection of hats to reveal your prizes. Your game continues until you pick a rabbit or a bomb.